Open Europe: EU budget surcharge: how much support does the UK have around Europe? EU budget surcharge: how much support does the UK have around Europe? David Cameron has taken a very tough position on the EU budget surcharge, claiming that he "won't pay" the £1.7bn the Commission has demanded from the UK by December 1 after concluding the UK had been underpaying into the budget relative to the size of its economy. Other countries have also been hit - so how much support does Cameron have around Europe? These changes which again are due to recalibration in the way the size of economies are calculated (more on this later) are being tagged on to the annual "adjustment" to the EU budget, which is basically normal procedure. However, this also means that EU leaders will have to agree to an "amending budget" via a decision taken by Qualified Majority Voting. This also means that the UK might have some chance of "blocking" the change if it can get other allies on board. Below is the voting balance, if all "net losers" are clubbed together under QMV. “Malta is not surprised that the EU has asked for this top-up… but we are still seeking clarifications on how the [Commission] calculated this figure”. "I think it's ludicrous to actually go and punish the one country that has suffered the reform. The results are showing up now - the unemployment rate has gone down to half what it is in France. The growth rate is four times what it is in France - and we go and punish the British? It's madness". Sadly for Cameron, Lellouche won't have a vote. 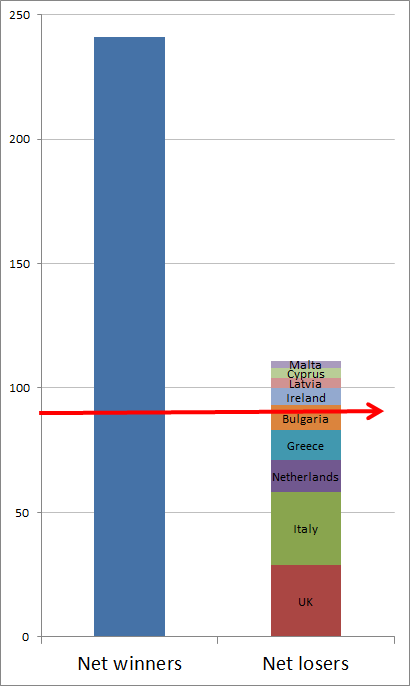 Why did the EU not impose fines on France and Germany when they blatantly broke the Maastrict Treaty with Annual Deficits greater than 3% of GDP ? Clearly not all members of the club obey the rules - so why should the UK? it's an embarrassment to the uk that it has to enlist other "nations'" support to get permission on how it spends its own money. Why doesn't Cameron say that we're not going to pay a fine? And what will happen if he does? The time has come when the Government have to accept that either THEY Govern this Country by and through its very own Common Law Constitution, or empty completely those Houses of Parliament and accept that all in both houses have been obeying the orders of Foreigners since Edward Heath took us in to the then EEC and told that deliberate lie, that if the people voted to remain in the then EEC, "There would be no loss of essential Sovereignty", knowing that it was a complete deliberate LIE. Of all the losers that Cameron has picked with regard to the EU since he came to office, this one has to be top of the list. This is a technical adjustment and the fact that Whitehall got its wires crossed and failed to alert the PM to the possible political implications does not change the fact. Our steel company does well, exports world wide, works hard and makes a million pounds of margin. Our nearest rival is slack and incompetent and makes a million pound loss. So along comes an unelected foreign power and orders us to pay our million pound profit to the loss making lame duck. Some policy! Encouraging failure over the years has put the EU where it is now: a sinking ship. It is now clear that this is an entirely manufactured row, a contrived attempt to rally public support behind a weak British Prime Minister whose conduct on the international stage has frankly become an embarrassment to his country. The UK therefore has nothing to complain about. Besides, it is sovereign and free to leave the single market if it thinks that the costs outweigh the benefits. Dividing into winners and losers is a sure way of ensuring there'll be winners and losers. Cameron will rant in public but pay the bill in private, because he truly believes that we are better off as a state subsumed by the eussr. He is only rating because he knows his poor eussr stance is a vote loser. It is clear that Open Europe is now owned by the EU and is no more than an EU quango. David Cameron is hamming the 2.2 billion euro bill because of the Rochester and Strood by election. 2. UKIP have NEVER said that UKIP would like to follow the Swiss Model. That OE is pure mischief. UKIP when Britain has left the EU want an "Open Trade Agreement" with the EU. No more, none at all. Same as the USA, Japan, China, Australia, Singapore - the REST of the World.